The M25 or London Orbital Motorway is 117 miles (188 km) long encircling almost all of Greater London, England (with the exception of North Ockendon). An ambitious concept to build four concentric ring roads around London was first mooted in the 1960s. A few sections of the outer two rings were constructed in the early 1970s, but the plan was abandoned and the sections were later integrated to form a single ring which became the M25, aka London Ring Road, finally completed in 1986. Greater London is a ceremonial county of England that is located within the London region. This region forms the administrative boundaries of London and is organised into 33 local government districts—the 32 London boroughs and the City of London, which is located within the region but is separate from the county. The Greater London Authority, based in Southwark, is responsible for strategic local government across the region and consists of the Mayor of London and the London Assembly. The City of London Corporation is the principal local authority for the City of London, with a similar role to that of the 32 London borough councils. North Ockendon is the easternmost and most outlying settlement of Greater London, England and part of the London Borough of Havering. It is located 18.4 miles (29.6 km) east northeast of Charing Cross and consists of a dispersed settlement within the Metropolitan Green Belt. It was historically an ancient parish in the county of Essex, that was abolished for civil purposes in 1936. North Ockendon is the only area in London located outside of the M25 London Orbital Motorway. North Ockendon is located on the border with Essex. The area to the south is South Ockendon. The London Ringways were a series of four ring roads planned in the 1960s to circle London at various distances from the city centre. They were part of a comprehensive scheme developed by the Greater London Council (GLC) to alleviate traffic congestion on the city's road system by providing high speed motorway-standard roads within the capital linking a series of radial roads taking traffic into and out of the city. Following a campaign by Homes before Roads, the scheme was cancelled in 1973, at which point only three sections had been constructed. It is one of the busiest of the British motorway network: the stretch between Junctions 14 and 15 outside Heathrow Airport consistently records the highest number of daily traffic counts on the British strategic road network with the average flow in 2017 of 211,059 counts (lower than the record peak measured in 2014 of 262,842 counts). This compares to 197,219 counts measured on the M1 motorway between junction 7 and 8 outside Hemel Hempstead in 2014, and 195,325 counts measured on the M60 motorway between junctions 12 and 13 in Western Manchester, also in 2014. The M60 motorway, Manchester Ring Motorway, or Manchester Outer Ring Road, is an orbital motorway in North West England. Built over a 40-year period, it passes through all Greater Manchester's metropolitan boroughs except for Wigan and Bolton. Most of Manchester is encompassed within the motorway, except for the southernmost part of the city which is served by the M56. The River Thames, known alternatively in parts as the Isis, is a river that flows through southern England including London. At 215 miles (346 km), it is the longest river entirely in England and the second longest in the United Kingdom, after the River Severn. The Dartford-Thurrock River Crossing, commonly known as the Dartford Crossing and until 1991 the Dartford Tunnel, is a major road crossing of the River Thames in England, carrying the A282 road between Dartford in Kent to the south with Thurrock in Essex to the north. It consists of two bored tunnels and the cable-stayed Queen Elizabeth II Bridge. The only fixed road crossing of the Thames east of Greater London, it is the busiest estuarial crossing in the United Kingdom, with an average daily use of over 130,000 vehicles. It opened in stages: the west tunnel in 1963, the east tunnel in 1980 and the bridge in 1991. The crossing, although not officially designated a motorway, is considered part of the M25 motorway's route, using the tunnels northbound and bridge southbound. Described as one of the most important road crossings in Britain, it suffers from heavy traffic and congestion. Bundesautobahn 10 is an orbital motorway around the German capital city of Berlin. Colloquially called Berliner Ring, it is predominantly located in the state of Brandenburg, with a short stretch of 5 km in Berlin itself. It should not be confused with the Berliner Stadtring around Berlin's inner city. Thurrock is a unitary authority area with borough status in the English ceremonial county of Essex. It is part of the London commuter belt and an area of regeneration within the Thames Gateway redevelopment zone. The local authority is Thurrock Council. 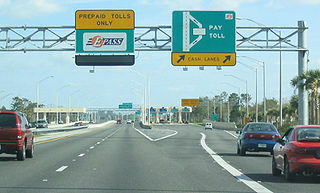 A toll road, also known as a turnpike or tollway, is a public or private road for which a fee is assessed for passage. It is a form of road pricing typically implemented to help recoup the cost of road construction and maintenance. The Woolwich Ferry is a free vehicle and pedestrian ferry across the River Thames in East London, connecting Woolwich on the south bank with North Woolwich on the north. It is licensed and financed by London River Services, the maritime arm of Transport for London (TfL). The service is operated by Briggs Marine under licence from TfL and carries both foot passengers and vehicles. Around two million passengers use the ferry each year. A dual carriageway or divided highway is a class of highway with carriageways for traffic travelling in opposite directions separated by a central reservation. Roads with two or more carriageways which are designed to higher standards with controlled access are generally classed as motorways, freeways, etc., rather than dual carriageways. The A21 is a trunk road in Southern England, one of several which connect London and various commuter towns to the south coast. It provides a link to Hastings, East Sussex and parts of Kent. Half of the distance covered is over gently undulating terrain, with some hills and bends. Often traffic is slow-moving, particularly on weekdays on the single carriageway stretches; and in summer with holiday traffic. Because of this, people have described the A21 as "a joke" and businesspeople have been reported to "hate coming down the A21". There have been many proposals to upgrade parts of the A21 in response to this. The M26 is a motorway in Kent, England. It provides a short link between the M25 at Sevenoaks and the M20 near West Malling. Originally, the M25 was unlit except for sections around Heathrow, major interchanges and Junctions 23–30. Originally, low pressure sodium (SOX) lighting was the most prominent technology used, but widening projects from the 1990s onwards have all used high-pressure sodium (SON) lighting and this has diminished the original installations. By 2014 only one significant stretch was still SOX-lit (Junction 25–26) and the units were removed the same year. The motorway passes through five counties. Junctions 1A–5 are in Kent, 6–14 are in Surrey, 15–16 are in Buckinghamshire, 17–25 are in Hertfordshire, and 26–31 are in Essex. Policing of the road is carried out by an integrated policing group made up of the Metropolitan, Thames Valley, Essex, Kent, Hertfordshire and Surrey forces. Little was done to progress these plans until the 1960s when the Greater London Council developed its London Ringways plan  consisting of four "rings" around the capital. Sections of the two outer rings – Ringway 3 (the 'M16 motorway') and Ringway 4 – were constructed in the early 1970s and were integrated into the single M25 orbital motorway. But the Ringways plan was hugely controversial owing to the destruction required for the inner two ring roads, (Ringway 1 and Ringway 2). Parts of Ringway 1 were constructed (including West Cross Route), against stiff opposition, before the overall plan was abandoned in 1973 following pressure from residents in the threatened areas. Construction of parts of the two outer ring roads, Ringways 3 and 4, began in 1973. The first section, between South Mimms and Potters Bar in Hertfordshire (junction 23 to junction 24) opened in September 1975 and was given the temporary general purpose road designation A1178 (a section of motorway-standard-road, originally the M16, which eventually was incorporated into the M25) was completed and operational before this. A Watford-avoiding route between the M1 and the A40 between north Watford and Denham was locally known as the Croxley Green/Rickmansworth bypass, and was operational about 1973/4; a section south of London (junction 6 to junction 8) opened in 1976. A section of Ringway 3 south of the river between Dartford and Swanley (junction 1 to junction 3) was constructed between 1974 and 1977. In 1975 the plans for Ringway 3 were modified to combine it with Ringway 4, the outermost Ringway. The M25 as a component of ringway 4, was first conceived to be an east-west road south of London to relieve the A25, and running parallel to it, with its eastern end following the route of what is now the M26. However, it was subsequently routed northwards towards the Dartford Tunnel to form, in conjunction with similar roads, including the M16 planned to the north of London, part of the London Orbital. The combined motorway was given the designation M25 which had originally been intended for the southern and western part of Ringway 4 and the M16 designation was dropped. The section of Ringway 3 west of South Mimms anti-clockwise around London to Swanley in Kent was cancelled. The stages were not constructed contiguously but in small sections. As the orbital road developed the sections were linked. Each section was presented to planning authorities in its own right and was individually justified, with almost 40 public inquiries relating to sections of the route. Maps at this time depicting these short sections named the route as the M16 but this changed before completion. The M25 between junctions 7 (M23) and 6 (A22) near Redhill, Surrey. The signs are indicating an advisory reduced speed of 40 mph (64 km/h) due to congestion. The improved junction is said to facilitate billions of pounds of investment in the region, making journeys more reliable and improving safety. In addition, the A13 through the junction has been widened to four lanes in each direction with speed limits capped to 50 mph. New dedicated link roads created and existing slip roads improved to facilitate east bound migration to the Regional Shopping Centre (Lakeside). Drainage, safety barriers and lighting on the M25 have also been upgraded as part of the improvements around Junction 30 and 31 including new electronic gantry signage. The M25 is the second-longest ring road in Europe, after the Berlin Ring (A 10), which is 5 miles (8.0 km) longer. Saint Petersburg Ring Road: more than 150,000 vehicles on an average day. A23 (Vienna): more than 200,000 vehicles on an average day. Moscow Ring Road: more than 250,000 vehicles on an average day. Data from driver location signs provide carriageway identifier information. The numbers on the signs are kilometres from a point near the River Thames, east of London, when travelling clockwise on the motorway. The table below gives details of each junction, including the roads interchanged and the destinations that are signed from the motorway on the blue advance direction signs. Figures in kilometres are from the driver location signs; figures in miles are derived from them. The M11 motorway is a 55-mile (88.5 km) motorway that runs north from the North Circular Road (A406) in South Woodford in northeast London to the A14, northwest of Cambridge, England. Originally proposed as early as 1915, various plans were considered throughout the 1960s, with final construction being undertaken between 1975 and 1980. The motorway was opened in stages, with the first stage opening in June 1975, and the completed motorway becoming fully operational in February 1980. Running from South Woodford to Girton, the motorway provides direct access to Harlow, a large new town, as well as the city of Cambridge and since 2002, the motorway has greatly improved access to London Stansted Airport, the fourth busiest airport in the United Kingdom. The M4, a motorway in the United Kingdom running from west London to southwest Wales, was originally referred to as the London-South Wales Motorway. The English section to the Severn Bridge was constructed between 1961 and 1971; the Welsh element was completed in 1993. The Second Severn Crossing officially renamed the Prince of Wales Bridge, was inaugurated on 5 June 1996 by HRH The Prince of Wales and the M4 was rerouted. 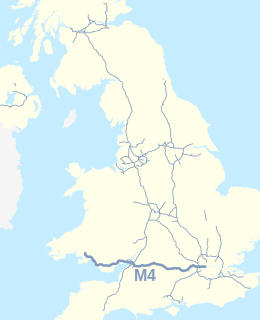 Apart from its two spurs—the A48(M) and the M48—the M4 is the only motorway in Wales. The M3 is a motorway that runs from Sunbury-on-Thames, Surrey, to Southampton, Hampshire, a distance of approximately 59 miles (95 km). Via its feeder the A316, the route is one of five roads of dual carriageway width or greater into the southern half of London. It also provides access to major towns and cities along its route, principally the Aldershot Urban Area, Basingstoke, Winchester and Southampton. The A2 is a major road in southern England, connecting London with the English Channel port of Dover in Kent. This route has always been of importance as a connection between the British capital of London and sea trade routes to Continental Europe. It was formerly known as the Dover Road. The M5 is a motorway in England linking the Midlands and the South West. It runs from Junction 8 of the M6 at West Bromwich near Birmingham to Exeter in Devon. Heading south-west, the M5 runs east of West Bromwich and west of Birmingham through Sandwell Valley. It continues past Bromsgrove, Droitwich Spa, Worcester, Tewkesbury, Cheltenham, Gloucester, Bristol, Weston-super-Mare, Bridgwater and Taunton on its way to Exeter, ending at Junction 31. It is the primary gateway to South West England. Congestion is common during the summer holidays, on Friday afternoons, and school and bank holidays on the section south of the M4. The M23 is a motorway in the United Kingdom, running from the south of Hooley in Surrey, where it splits from the A23, to Pease Pottage, south of Crawley in West Sussex where it rejoins the A23. The northern end of the motorway starts at junction 7 on what is effectively a 2-mile (3.2 km) spur north from junction 7 of the M25 motorway. From Hooley it runs for 17 miles (27 km) past Redhill, Gatwick Airport and Crawley. A spur runs from junction 9 to Gatwick Airport. The N11 road is a national primary road in Ireland, running for 129 km (80 mi) along the east side of Ireland from Dublin to Wexford. It passes close to Bray, Greystones, Wicklow, Arklow and Gorey and also passes through Enniscorthy, amongst others. Beyond Wexford, the route continues to Rosslare as the N25. The road forms part of European route E01. As of 2015 the N11/M11 is of dual carriageway or motorway standard from Dublin as far as Gorey in County Wexford. The North Circular Road is a 25.7-mile-long (41.4 km) ring road around Central London in England. It runs from Chiswick in the west to Woolwich in the east, and connects the various suburbs in the area, including Ealing, Willesden, Wembley, Finchley, Southgate, Edmonton, Woodford, Ilford, and Barking. Together with its counterpart, the South Circular Road, it forms a ring road through the Outer London suburbs. This ring road does not make a complete circuit of the city, being C-shaped rather than a complete loop as the crossing of the River Thames in the east is made on the Woolwich Ferry. The A453 road was formerly the main trunk road connecting the English cities of Nottingham and Birmingham. However, the middle section of this mainly single-carriageway road has largely been downgraded to B roads or unclassified roads following the construction of the parallel M42-A42 link around 1990. The M42 was originally meant to pass further north than it does, and to join the M1 at Sandiacre in Derbyshire. The M42/A42 does not enter Derbyshire, but instead joins the M1 closer to the A453 junction at Kegworth. The A42 shadows the former A453 from Appleby Magna to Castle Donington. The road historically connected the East Midlands with the West Midlands. South Cross Route (SCR) was the designation for the southern section of Ringway 1, the innermost circuit of the London Ringways network, a complex and comprehensive plan for a network of high speed roads circling and radiating out from central London designed to manage and control the flow of traffic within the capital. Ringway 2 was the second innermost of the series of four London Ringways, ring roads planned in the 1960s to circle London at various distances from the city centre. They were part of a comprehensive scheme developed by the Greater London Council (GLC) to alleviate traffic congestion on the city's road system by providing high speed motorway-standard roads within the capital linking a series of radial roads taking traffic into and out of the city. The scheme was cancelled in 1973. Ringway 3 was the third from the centre of the series of four London Ringways, ring roads planned in the 1960s to circle London at various distances from the city centre. They were part of a comprehensive scheme developed by the Greater London Council (GLC) to alleviate traffic congestion on the city's road system by providing high speed motorway-standard roads within the capital linking a series of radial roads taking traffic into and out of the city. Most of the scheme was cancelled in 1973. Ringway 3 was planned as a new motorway running either through or around the periphery of the capital's outer suburbs linking areas such as Barnet, Epping, Dartford, Purley and Chessington. Construction began on the first section of the motorway between South Mimms and Potters Bar in 1973 and the motorway was initially designated as the M16 motorway before its opening. The Lower Thames Crossing, or Third Thames Crossing, is a proposed new road crossing of the River Thames estuary linking the county of Kent with the county of Essex through Thurrock. The route was confirmed on 12 April 2017 by Transport Secretary Chris Grayling. It is designed to relieve the pressure on the existing A282 Dartford Crossing. After consideration, changes have been made to the plan to make it less obtrusive- the junction with the A226 has been eliminated, and the upgrade extended to the M2, junction 1. The Auckland Northern Motorway in the Auckland Region of New Zealand links central Auckland City and Puhoi in the former Rodney District via the Hibiscus Coast and North Shore. It is part of State Highway 1. Ringway 4 was the outermost of the series of four London Ringways, ring roads planned in the 1960s to circle London at various distances from the city centre. They were part of a comprehensive scheme developed by the Greater London Council (GLC) to alleviate traffic congestion on the city's road system by providing high speed motorway-standard roads within the capital linking a series of radial roads taking traffic into and out of the city. Most of the scheme was cancelled in 1973. ↑ "GB Road Traffic Counts". data.gov.uk. ↑ "New Lower Thames Crossing to cut congestion and create thousands of jobs". www.gov.uk. 1 2 "M25 in South East Region". The Motorway Archive. 2009. (Select "M25" from list of motorways, then "M25 interchanges, tunnels and bridges"). Retrieved 18 April 2013. ↑ This move would be bound to be resisted by the communities affected, including such major towns as Watford, Loughton and Epsom. The M25 is called “The Worst Road To Go To” according to many Londoners and Visitors. London Assembly Archived 9 October 2008 at the Wayback Machine – Poll says M25 is London's "natural boundary". 2 March 2004. ↑ Communications Act 2003, The National Archive, 2003, retrieved 5 September 2011 that requires "a suitable proportion of the programmes made in the United Kingdom" to be made "in the United Kingdom outside the M25 area", defined in Section 362 as "the area the outer boundary of which is represented by the London Orbital Motorway (M25)". ↑ "M25 MSA New Barn Farm Cobham". Highways Agency. Archived from the original on 3 March 2010. Retrieved 14 August 2010. ↑ "Cobham M25 service station opened". BBC News. 13 September 2012. Retrieved 13 September 2012. ↑ "Motorway traffic up 4% on 2003". BBC News. 12 August 2004. Retrieved 3 January 2009. ↑ J. F. Bramley (1946). Roads for Britain: a digest of plans of future highways (2nd ed.). Staples Press. p. 14. ↑ Smith 2001, p. 148. ↑ John Henry Forshaw, Sir Patrick Abercrombie (1943). "County of London plan". London County Council: 13. ↑ Hamilton 2015, p. 19. ↑ "Hansard 3 December 1990 Written Answers (Commons) Transport". ↑ "The bluffer's briefing on: The M25". The Independent. London. 24 March 1993. Retrieved 12 May 2010. ↑ Webster, Ben (25 June 2009). "Rising costs put the brakes on dozens of roadbuilding projects". The Times. London. Retrieved 12 May 2010. ↑ "M25 scoop for Balfour in Surrey". ↑ "Case Study – M25 Controlled Motorway". Highways Agency. Archived from the original on 11 February 2010. ↑ Wolmar, Christian (4 April 1995). "The roadblock that became a bandwagon". The Independent. London. Retrieved 12 May 2010. ↑ Cohen, Nick (2 April 1995). "Pointless lies that reveal so much". The Independent. London. Retrieved 12 May 2010. ↑ Wolmar, Christian (21 March 1997). "Minister gives green light to widen M25". The Independent. London. Retrieved 12 May 2010. ↑ "Plans to widen M25 to 12 lanes under attack". Archived from the original on 5 April 2012. ↑ "BAA makes plans for Terminal 5 despite inquiry". ↑ "M25 Junctions 12 – 15 Widening". Archived from the original on 5 September 2011. In 2003, Balfour Beatty Civil Engineering was awarded the £148 million contract to widen the 10-mile stretch of the M25, between Junction 12 (the M3 Interchange) and Junction 15 (the M4 Interchange). ↑ "M25 Jct 12 to 15 Widening". Highways Agency. Archived from the original on 26 September 2008. ↑ "£75 MILLION REFURBISHMENT FOR M25 HOLMESDALE TUNNEL AND JUNCTION 25 IMPROVEMENT WORK STARTS ON SATURDAY 6 May". Highways Agency. Archived from the original on 6 November 2008. ↑ "M25 Junction 28 / A12 / Brook Street Interchange". Highways Agency. Archived from the original on 26 September 2008. ↑ "Prequalification Document". Highways Agency. Archived from the original on 7 November 2008. Retrieved 20 January 2008. ↑ "Highways Agency announces shortlist for £4.5bn M25 DBFO". Contract Journal. Archived from the original on 16 January 2016. Retrieved 20 January 2008. ↑ "Cost escalation hits M25 widening benefit to cost ratios". ↑ Helm, Toby (18 January 2009). "Ministers scrap plan to widen motorways". The Guardian. London. Retrieved 12 May 2010. ↑ Webster, Ben (20 May 2009). "PFI deal for M25 agreed despite price rise". The Times. London. Retrieved 12 May 2010. ↑ "£6.2 billion M25 Design, Build, Finance and Operate (DBFO) contract awarded". Highways Agency. Archived from the original on 15 November 2009. ↑ "M25 Jct 16 to 23 Widening". Archived from the original on 22 September 2009. ↑ "M25 widening to four lanes begins". BBC News. 8 July 2009. Retrieved 12 May 2010. ↑ "Highways Agency Timetable". Archived from the original on 26 September 2008. ↑ "Weekly Summary of Roadworks in M25 Sphere – 30 September 2009". Archived from the original on 2 October 2009. Retrieved 11 October 2009. ↑ "M25 Jct 27 to 30 Widening". Archived from the original on 4 October 2009. ↑ "M25 Junctions 5 to 7 Managed Motorways". Archived from the original on 8 September 2012. Retrieved 11 October 2009. ↑ "M25 Junctions 23 to 27 Managed Motorways". Archived from the original on 17 August 2012. Retrieved 10 December 2008. ↑ "Dartford River Crossing Study into Capacity Requirement" (PDF). Department for Transport. 20 April 2009. Archived from the original (PDF) on 19 July 2009. Retrieved 26 April 2009. ↑ "Transport Scotland – M74 Completion Project". Archived from the original on 18 December 2009. Retrieved 6 September 2009. ↑ "Compte Rendu Analytique Officiel de la Seance du 17 Decembre 2002" (in French). ↑ Lezard, Nicholas (21 September 2002). "Meandering round the M25". The Guardian. ↑ "Chris Rea interviewed by Will Hodgkinson, The Guardian, Friday 13 September 2002". London. 13 September 2002. Retrieved 31 January 2009. ↑ Pratchett, Terry; Gaiman, Neil (1993). Good Omens. London: Corgi Books. p. 19. ISBN 0552137030. ↑ Neil Gaiman (11 April 2003). "Neil Gaiman's Journal". HarperCollins . News Corp . Retrieved 25 March 2017. ↑ "Orbital information". Archived from the original on 15 February 2011. Retrieved 28 January 2011. ↑ May, James (20 October 2007). "Speed, Greed And The M25". BBC Radio 4. ↑ "Programme Information – Network Radio Week 43" (Press release). BBC Press Office. 1 2 3 "M25 Road Network Driver Location Signs" (PDF). Highways Agency. Archived from the original (PDF) on 5 June 2011. Retrieved 9 June 2009. Hamilton, Ray (2015). M25: A Circular Tour of the London Orbital. Summersdale Publishers. ISBN 978-1-783-72656-1. Smith, Denis (2001). London and the Thames Valley. Thomas Telford. ISBN 978-0-727-72876-0. Sinclair, Iain (2002), London Orbital: A Walk Around the M25, London: Granta Books, ISBN 1-86207-547-6 . Phippen, Roy (2005), Travelling M25 Clockwise, London: Pallas Athene, ISBN 1-873429-90-8 . Wikimedia Commons has media related to M25 motorway .